The colour cyan - between green and blue - is a hidden factor in encouraging or preventing sleep, according to biologists. Sleep researchers have already established links between colours and sleep - with blue light having been identified as more likely to delay sleep. There have been "night mode" settings for phones and laptops which have reduced blue light in an attempt to lessen the damage to sleep. Image caption Is cyan going to keep you awake? When people were exposed to more or less cyan, researchers were able to measure different levels of the sleep hormone melatonin in people's saliva. For instance, there are shades of green that can include cyan - which also can be achieved using other colour combinations. 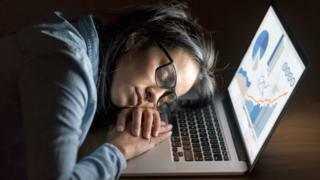 The researchers suggest that versions of the colour using cyan could be used on computer screens if the aim was to keep people awake - such as people working and required to stay alert at night. The research used this with a movie - with the colours being adapted to include or exclude cyan - and found changes in viewers' sleepiness and levels of melatonin in saliva. "This outcome is exciting because it that tells us that regulating exposure to cyan light alone, without changing colour, can influence how sleepy we feel," said Prof Lucas. How long does it really take you to fall asleep?